In the mid '60s, the Maundy Quintet and the Epics were at the vanguard of pop in Gainesville, setting standards for many of the talent that would follow. THey were also among the first to break free of the "Beatle clone" look and sound, and to start performing songs that didn't come from the latest Hot Hit list. There was talent brewing on the bandstands of Hogtown. Restless, uncontainable talent. Bernie Leadon, for example, lead guitarist for the Maundys. His heart was in bluegrass and folk music, not rock 'n' roll. He left Gainesville around '67, tired of covering Top 40 hits in teen clubs when what he really wanted to do was play the banjo. In California that same year, he met the like-minded Gram Parsons, and Bernie Leadon soon became one of the original Flying Burrito Brothers. In 1971, Leadon got together with three buddies from the California club circuit. They called themselves the Eagles, and Leadon got to play banjo, guitar, dobro and whatever else he felt moved toward. He co-wrote the group's second hit "Witchy Woman." 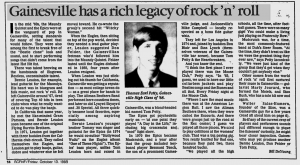 When the Eagles, then sitting on top of the pop world, decided they needed a lead guitar player, Leadon suggested Don Felder, the Gainesvillian fretman who'd followed him into the Maundy Quintet. Felder lasted until the Eagles disbanded in 1980, four years after Leadon designed. When Leadon was just sticking out his thumb for California, Gainesville was getting a reputation -- as most college towns do -- as a great place for bands to play. The Allman Brothers Band performed here countless times, and later so did Lynyrd Skynyrd and .38 Special. All three quickly became local favorites, especially among aspiring musicians. Bernie Leadon's younger brother Tommy was singer and guitarist for the Epics (in 1974 he would co-author "Hollywood Waltz" on the Eagles album "One of These Nights"). 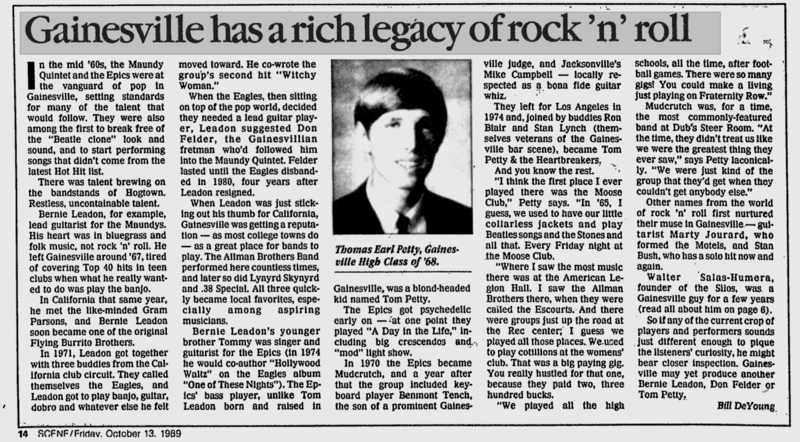 The Epics' bass player, unlike Tom Leadon born and raised in Gainesville, was a blond-headed kid named Tom Petty. The Epics got psychedelic early on -- at one point they played "A Day in the Life," including big crescendos and "mod" light show. In 1970 the Epics became Mudcrutch, and a year after that the group included keyboard player Benmont Tench, the son of a prominent Gainesville judge, and Jacksonville's Mike Campbell -- locally respected as a bona fide guitar whiz. They left for Los Angeles in 1974 and, joined by buddies Ron Blair and Stan Lynch (themselves veterans of the Gainesville bar scene), became Tom Petty & the Heartbreakers. And you know the rest. "I think the first place I ever played there was the Moose Club," Petty says. "In '65, I guess, we used to have our little collarless jackets and play Beatles songs and the Stones and all that. Every Friday night at the Moose Club. "Where I saw the most music there was at the American Legion Hall. I saw the Allman Brothers there, when they were called the Escourts. And there were groups just up the road at the Rec center; I guess we played all those places. We used to play cotillions at the womens' club. That was a big paying gig. You really hustled for that one, because they paid two, three hundred bucks. "We played all the high schools, all the time, after football games. There were so many gigs! You could make a living just playing on Fraternity Row." Mudcrutch was, for a time, the most commonly-featured band at Dub's Steer Room. "At the time, they didn't treat us like we were the greatest thing they ever saw," says Petty laconically. "We wee just the kind of the group that they'd get when they couldn't get anybody else." Other names from the world of rock 'n' roll first nurtured their muse in Gainesville -- guitarist Marty Jourard, who formed the Motels, and Stan Bush, who has a solo hit now and again. Walter Salas-Humera, founder of the Silos, was a Gainesville guy for a few years (read all about him on page 6). So if any of the current crop of players and performers sounds just different enough to pique the listeners' curiously, he might bear closer inspection. Gainesville may yet produce another Bernie Leadon, Don Felder or Tom Petty.